WIAA Handbook rule 20.3.1.E. mandates that "hands-on" stunt certification is required for cheer coaches who intend to have their cheer squad perform stunts. The certification program must be approved by the WIAA. Coaches must be recertified every three (3) years. Because of WIAA Handbook rule 20.3.1.H.1.b, which requires that assistant coaches must be at least 19 years of age, certificates for completing a stunt certification clinic and passing the test will be issued only to individuals who are at least 19 years of age. Additionally, you must pay the registration fee, complete the clinic and pass the required test before receiving your certification document (via e-mail) following your clinic date. The only acceptable method of payment is by CHECK (made payable to the WIAA) and must be paid on-site. Any coach who fails to pay on the day of the clinic will not be allowed to participate in the certification. *A minimum of six (6) coaches must be registered for each certification course in order for the clinic to be held. Payment and registration lists are submitted to the WIAA office by the WIAA stunt clinician. Checks are deposited by the WIAA Director of Finance. Certificates and verification of completion are emailed to the clinic participants with two to four weeks following the clinic. Please plan accordingly. Stunt Certification Clinics will be offered at various locations throughout the year, so check back periodically. The clinic fee is $65 and registration is open to anyone in need of the certification. Upon verification of availability from one of the WIAA stunt clinicians, the clinic will be posted on the WIAA Website. Provided a minimum of six (6) individuals have preregistered for the course, it will be held. 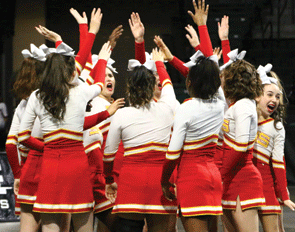 State Cheer information: schedule, results, qualifier information and more.